Numerical vocabulary: The Maldive word for number and numeral was aka. Now this seems to be replaced by an English derivative, nambaru. The probable reason for the change was because aka acquired a stigma by association with numerology and the pseudo-Islamic fanditha witchcraft. The word aka still survives in mathematical usage and means square as in square metre. Mathematical area still is called akamin. Numeral is also known as viya akuru which means mathematical script. 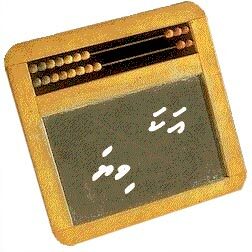 Counting system: The original Maldive counting system appears to be decimal (base ten) but at some stage in history a duodecimal (base twelve) system was superimposed over this and survived until the early part of the twentieth century when the decimal system was restored to common usage. This restoration was probably influenced by Borah merchants from the British province of Bombay in India who set up shop in Male towards the middle of the nineteenth century. Some of the current decimal numbers past eleven and all of the decimal numbers used until early in the twentieth century (even now by stuffy civil service accountants) reflect the Gujarati and Hindustani influence of the Borahs. Why decimal? The decimal system was probably based on the fact that most humans have ten digits between their hands. The duodecimal system was probably based on the twelve moons of the seasonal year. Obviously early Maldivians or whoever brought the duodecimal system to the Maldives looked past their own hands into the heavens for mathematical inspiration. A maritime people would have considered the four cardinal points of the compass as providing a basis of their counting system. Four is a factor of twelve rather than ten. The numbers: The first ten numbers of the old duodecimal system are very similar to the decimal numbers of Sanskrit and Latin. This possibly indicated that a decimal set of numbers pre-dated the intermediate duodecimal numbers. Eleven and twelve in the doudecimal system correspond to the current eleven and twelve of the Sinhala language of Sri Lanka. Interesting points to note are the similarities between the decimal 25 (fansavees) and the duodecimal 24 (fassihi). Fassihi nearly literally means five and twenty. This also lends to the belief that a decimal set of numbers may have pre-dated the duodecimal. The decimal word for fifty (fansaas) and the duodecimal word for 48 (fanas) are also similar. The decimal and doudecimal word for 60 is exactly the same and we must remember 60 is the lowest common number in both systems that ends with a zero (zero is suhn in both decimal and duodecimal Divehi). Pre-Arabic (Hindu) numerals: The basis of the pre-Arabic (Hindu) Maldive numerals was the first eleven (in the duodecimal system) and the first nine (in the decimal system) letters of the older Divehi (Divess) script. These numbers can still be seen in surviving old manuscripts. Alphabet based on numerals: The modern Thaana script was invented based on the numerals known to Maldivians at that time. The first nine letters of the Thaana script are called the letters of the Arabi aka (Arabic numerals) and look like the Arabic/ Persian numerals of the Hindu counting system. The next nine Thaana letters are called the letters of the Divehi aka (Divehi numerals) and look like the first nine base letters (consonants without the vowel extensions) of the Divess script. the remainder of the Thaana consonants were derived by adding "arms", "legs" and dots to the Arabi aka and Divehi aka consonants. As a sweetener for the mullahs, the vowels known as fili were derived from the diacritical marks used in the Arabic text (Mushaf) of the Koran (Islamic holy book). The Thaana alphabetical script used to write modern Divehi was invented in resistance to the drive to Arabise and strip the Maldives of its national heritage by the Islamic intelligentsia. In that regard Maldivians proved to the mullahs to be resilient and a tougher nut to crack than the Persians, Islamised Indians, Turks and the Malays who all abandoned their indigenous writing systems and/ or adopted the Arabic script. The Turks and the Malays have since dropped the clumsy Arabic alphabet in favour of the Roman alphabet. Maldivians invented their own non-Indic, nevertheless, non-Arabic script we now call Thaana to replace the former Indic script called Divehi Akuru. The Indic script was written from left to right. The mullahs objected to that and tried to impose a modified Arabic script which they called hedhi akuru. The civil intellectuals refused a bar of that and devised the compromise Thaana script. This was a curious merger of the duodecimal and decimal. It must be remembered that at that time the Sterling pound consisted of 240 pence, which was equal to 960 farthings, interestingly multiples of 12. When the Maldives adopted the rufiyaa as its own currency and issued its own currency notes in 1947, the Maldive rufiyaa was set at 100 laari. The use of the Imperial coinage was evidenced in the following verse of a poem by Bodufenvalhugey Seedi, the author's maternal grandfather. Seedi was a member of the ruling Council of Regency that decreed the introduction of the decimalised Maldive paper currency in 1947 to replace the de facto Imperial coinage. Ever wondered what is this thing? Goldsmiths continued to use the Imperial coinage as weights, as they had done for many decades. One silver anna was 60 grains Troy. The Indian rupee was 91.66% silver. The Ceylon rupee was 80.00% silver until World War I, when it was reduced to 55.00% silver. As a result there was a tendency for mostly Indian coins to remain in circulation in the Maldives. Until 1960, the laari coins came in denominations called the kuda laari (small laari) medhu laari (middle laari) and bodu laari (big laari). The kuda laari was equal to one laari, the medhu laari was equal to three laari and the bodu laari was equal to four laari. Three and four are factors of twelve rather than ten indicating the duodecimal influence on the currency. From 1960, the older laari coins were gradually phased out and were replaced by decimalised denominations. Duodecimal-decimal amalgums: There were many other examples of the decimal-duodecimal merger. One of the titles of the Maldive sovereigns was "King (Queen) of Twelve thousand Isles". This was clearly not the number of Maldive islands but was meant to symbolise a huge number. A standard packet of cowrie shell, the main export of ancient Maldives consisted of 12,000 shells and was called a kottey. Time: The basic unit of the Maldive clock was the dhan, which was equal to three hours. There were four daylight dhan and four nocturnal dhan making a total of eight dhan in twenty four hours. The twenty four hour period was called addan-iru, which literally meant "eight dhan period"
Who knew the biggest number? - the English the Indians or the Maldivians? As a Year Four (Grade 3) primary school pupil, one day I returned from school and announced jubilantly to my mother that I had learnt the biggest imaginable number from Mr Peter Wise, my new teacher. I was sure my mother would be totally ignorant of that number. She asked me what the number was and I replied that if she wrote down a one followed by six naughts she would have that number and was called a million. My mother told me that she was not too sure of this million number but she knew the Divehi name of the number written with one followed by 20 naughts. She called it dhiha mahaasinku. To my absolute disbelief she claimed she could name every number between one and dhiha mahaasinku in Divehi. The Maldive decimal system of numbers to the power of ten were as follows. They were probably derived from Sanskrit? I did not challenge Mr Wise to see if he had a term for dhiha mahaasinku.